andcarne wrote: How exactly is that speed test being set up? The speed test there is a very quick modification done by The_Goldfish that flys through each level, the long test taking about 15 mins to finish. 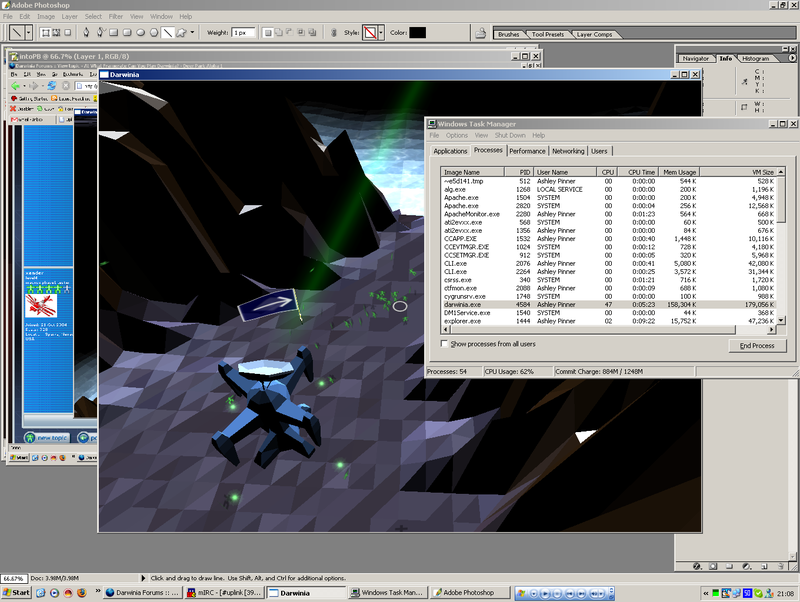 The levels are empty, as the new code only provides a performance boost for the land rendering, so that is what is being tested. If you have access to the beta forums (and looking at your title list that shouldn't be a problem), you'll find a few topics over speed that me and The_Goldfish posted a bunch of graphs in, you'll find the mod for this. We all used something called FRAPS to record our framerates to a text file, but you'll have to find a Mac equivalent to do it for you. Then we shoved our data into Excel and came out with the above graphs. Using the settings specified for the test (it didn't say to use Pixel effect or not), in the Garden level (already completed, but there are virii on the level again), i get 7-8 FPS with pixel effect turned on and 15-17 with pixel effect turned off. On the Mine Level (also completed), i get 4FPS with the pixel effect turned off and 7-8 with pixel effect turned on. I usually play with everything set to "Low" or "I need an upgrade", 800x600 full screen, 16, all sound options turned as low as possible. Using this configuration, i get around 19FPS on Mine. BTW, Tiger definitely gave me a framerate bump. Just as a point of comparison...My PC at work is a P4, 2.8, 2G RAM, Nvidia 6600GT and i can play 1200x1024 with all settings on High and i get 25-45FPS depending. Alas, i don't get to play very often at work however. Just wondering (see previous post for my current setup), would an upgrade from a Nvidia Twinview to an ATI 9600 (modded for G4) or 9800 make a significant difference? Or is the game more CPU bound? In the early stages, the levels are relatively simple, so a better graphics card will improve your framerate hugely. 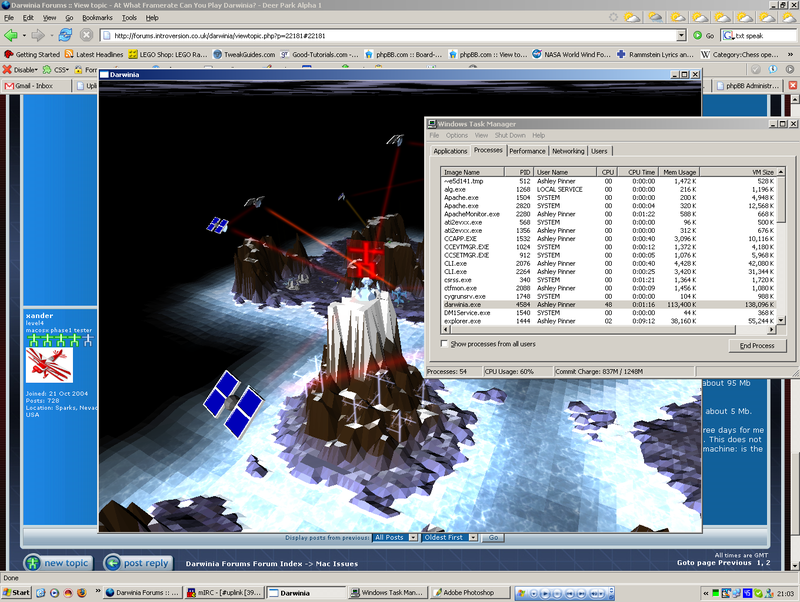 In the later stages, the levels are at least as graphically complex, but also require a fast CPU to run well due to additional AI complexity of managing many entities simultaneously. This type of problem happens in pattern buffer on windows as well, and seems to attribute itself to a memory leak somwhere. Later levels do not suffer from the same problem, nor earlier levels, so I belive its down to something that is unique to pattern buffer. (Possibly the DG guy image). I am inclined to agree with atze -- the problem seems to be AI bound. Pattern Buffer slowed down quite a bit on my machine (a 1 Ghz G4 PowerBook), but Bioshpere and Temple were far worse. Reciever was also quite bad, but I think that is due to soul rendering -- for some reason, all those falling souls really bog things down. First, I ran Darwinia, entered Pattern_Buffer, and let it idle for about half an hour. In that time, the memory footprint of Darwinia went from about 80 Mb of real memory and 270 Mb of virtual memory to 85 Mb and 275 Mb, respectively. Second, I captured one of the buildings that triggers the SpawnPoint, and let red DGs flood in. With the first wave, the memory footprint shot up to about 95 Mb and 295 Mb, but after half an hour of units pouring in, memory usage was at about 103 Mb and 301 Mb. Finally, I entered Garden and let it idle for half an hour. 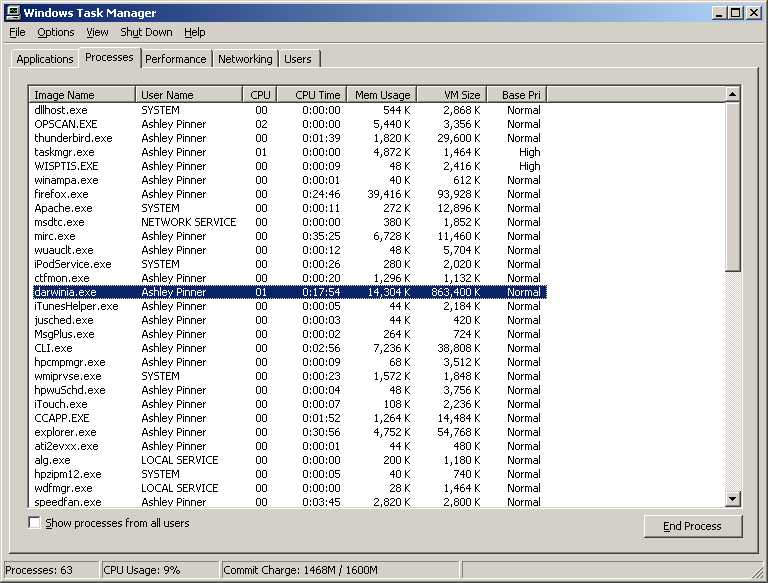 At the end of this time, both the virtual memory and real memory footprints had increased by about 5 Mb. So, based upon that test, I do not think that Pattern_Buffer is leaking any more than any other level. At the rate of 10 Mb per hour, it would take three days for me to see the same footprint that you report. Now, my understanding is that the memory leak on the Windows version was linked to 3D Hardware Sound. This does not seem to be an option on my machine (a Mac PowerBook). Thus far, I had assumed that this was not an option at all. To anyone with a Mac desktop machine: is the option to enable/disable 3D Hardware Sound available? So, as I said before, I think the problem is related to the AI, as CPU usage shoots up in levels with lots of red DGs. Wating only 5 mins in pattern buffer: 158MB physical, 178MB virtual. Thats an increase of 9MB physical memory per min, 8MB virtual per min. 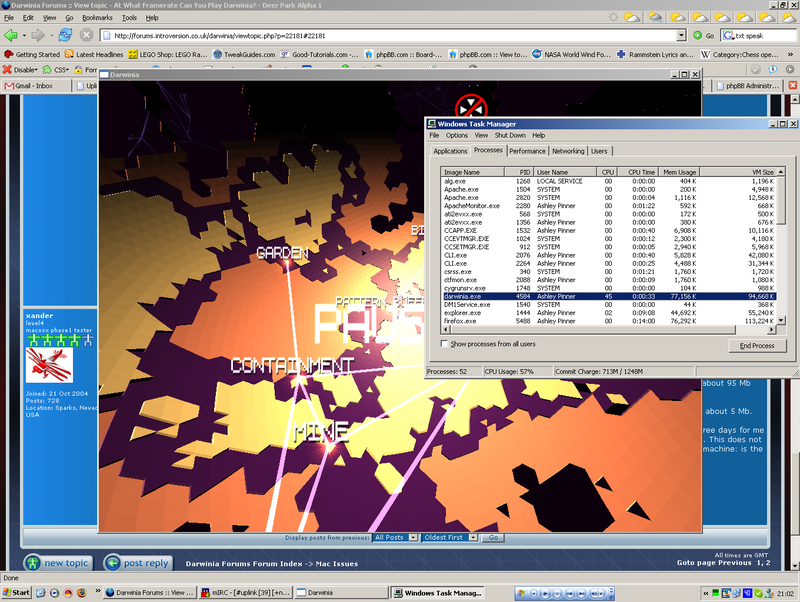 I've been able to, on many occasions, crash Darwinia in pattern buffer by making it consume 2GB memory. However, this problem doesn't affect me on Biosphere or Temple, in any way, after any amount of time. Oh dear lord, don't make people run Rendertest 4, just DON'T! I think this is the url for the archive containing rendermark is this and that rendertest 4, if you really, *really* want to do it (I suggest you don't because it's AGONY), I think this should set you straight. I'll be running it on 1.2 here, so it'll probably crash. I'm also having a hard time finding something to sample framerates, and I'd hate to have to sit there with a pen and paper. I haven't any idea about what happens next. As for that memory leak... And people yelled at ME when i ended up with a few small memory leaks because of misplaced char* variables?! 9 freaking megs in 5 minutes? /me wonders what the heck darwinia is doing o_O They seem to have fixed that in the windows version however, at least, somewhat. I only encounter a memory leak when the game is paused and i have the task manager pulled up, otherwise, no leak. But when it is leaking its doing so at a rate of 500k a second.